The perfect place for active and enquiring young minds, the Singapore Discovery Centre is a great place to bring the kids for the day. Children will love the colourful exhibits which will teach them all about Singapore's past and present in fun and informative ways. 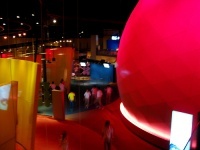 With popular permanent exhibitions and constantly changing temporary attractions to keep things fresh and exciting, visitors will have a hard time deciding where to start, from 4D movies to exhibits you can touch and interact with, children will love the Singapore Discovery Centre. Many of the attractions are aimed at young teenagers and include not just interesting information on Singapore but fun activities that will get kids thinking about career choices: visitors can experiment with town planning, using Singapore as a model; try out being a TV reporter by reading the news on film; be a general on a battlefield for a day with an immersive game; learn traditional Singaporean dance moves in a digital dance studio; and play games designed to test entrepreneurial ability. There is even a theatre which explores what to do in emergency situations like a terrorist attack. Adults will also enjoy the Discovery Centre and will be delighted with the educational entertainment for their families.